Your interests: Mordor, Mordor, Mordor! Your motivation: Ever since I joined I've always wanted to help build Mordor, This is my expertice, in dark and tall stuff, as well I want this title for the prestige! P.S the screenies provided are of my Forsaken Inn and henry's houses, I did not take any Screenshots of my Orthanc. Use different blocks for the surface one the second floor, in my example i used a mix of Light Blue wool and cracked stone brick to show that the wall is ageing. I added vegetation and overgrowth to show that nature is taking back the building, going through cracks in the walls or broken windows. I used sever different blocks and changed up the frame so it doesn't repeat to much and added random fences, just for the extra detail. Things like this you need to include. Of course this inst much forsaken but i hope this helps and get my point across. Practice these details and you will greatly improve your builds. Along with ooits' points about your build looking flat and undetailed I'd also like to add that it is fairly unrealistic in terms of both appearance and design. For starters it's absolutely massive. Far larger than any roadside inn would ever need to be. Your roof in particular is especially massive. A roof that large would be faar too heavy to be held up by anything short of modern inventions like concrete or steel. Break the roof up into smaller sections held up by load-bearing walls inside (or preferably you split the building up into differrnt wings which would be a great opportunity to add more detail but would also mean you'd basically have to start over so I can understand why you wouldn't want to do that). Secondly your inn doesn't look forsaken at all, in fact it looks very much still inhabited with torches lighting the halls, food on the tables, a big roast on the grill, the chairs and tables set for dinner and newly made beds in the guest rooms it looks very much still fully operational albeit slightly overgrown. And that brings us to my third point. Your inn doesn't look even slightly worn down or ruined. In fact, in combination with your flat featureless walls it looks almost like some modern resort building where the wall crawlers and few rustic elements are there on purpose as part of the design. I'd suggest breaking holes in the floors and adding patches of dirt and stone in the bottom floor where the floorboards have rotted away and add some cracks and holes in the facade as well and if possible mix it up a bit with blocks that looks more weathered and worn down (I say "if possible" because I know and am aware of the fact that there are very few such blocks in the Eriador rp). So, TLDR: consider reducing its size in general, reduce roof size and split it up into smaller sections, remove signs of life like food and light sources, scatter the furniture about so it doesn't look so orderly, add cracks in floors and walls and if possible mix up your blocks with more weathered looking ones. Also please change out those wooden plank pillars you have at the front. That's just not how planks works. Planks just wouldn't be sturdy enough to hold up that upper floor. Best of luck with your building and I hope you're willing and determined to improve. Ok so I will make it Forasken! Probably not the place for it but, the depth meme is still a thing? Why would you think using arched wooden walls in 2018 is in any way realistic or looks good, simplicity my dude. I get flat walls are considered a concept from the depths of hell itself here but it's still possible with the MCME resources and certainly looks better than spamming logs and arches, literally not even evolved from 2014 days. I'm shocked you guys still use this heavily outdated method of building..
so I just need to change the roof? And what do you mean "Edge to the Shingles"? No that is not the only thing, look at the border of your plot and you will find more comments which sum up the build generally. Yeah sorry I was not specific in that message: I mean the rake and the eaves of the roof should be wood (most likely oak). 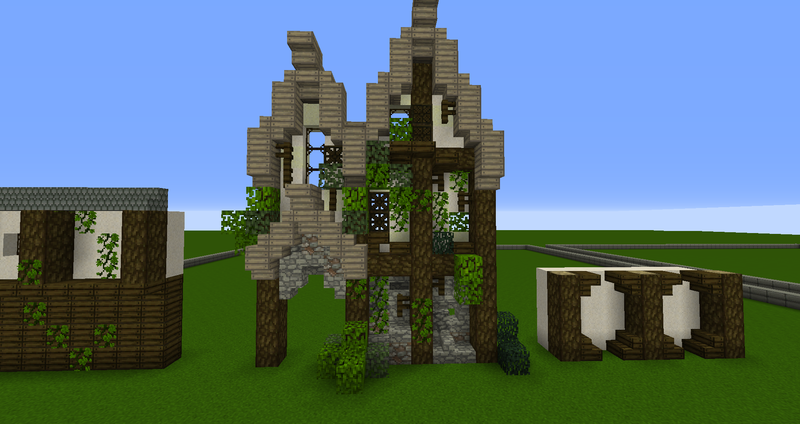 You can see this on a lot of houses throughout MCME. 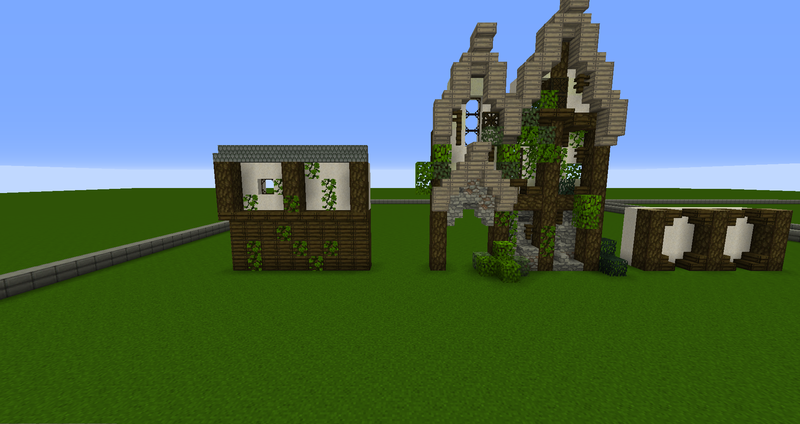 Im just using depth in the sense of, changing things up in your builds sorry you don't agree with my wording. Reading this made me realize I'll really need to read up on english roof terminology. If you could also upload these pictures for your application to an imgur link Imgur as its looks much nicer. -The tree you made still needs some work, you should go to our builder's school or /warp stctemp to learn how to build trees. I would like to see you do another themebuild and how you progress with it before making another decision or moving forward with your application.